The Risen Lord From the civory in the Chapel of the Resurrection, Pusey House in Oxford. The design is by Comper. 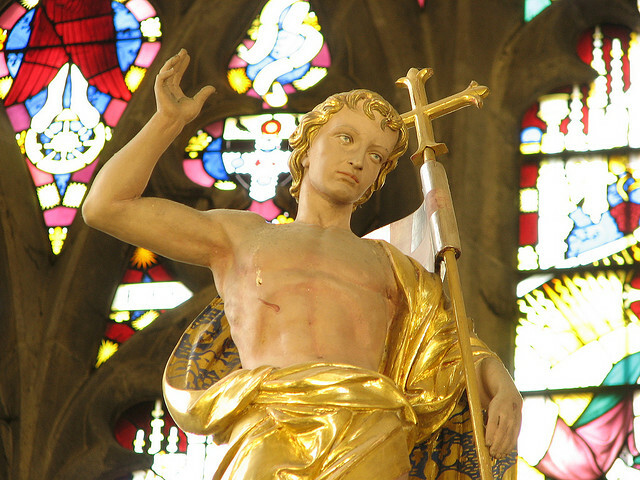 It is typically Comper to see Jesus Christ depicted as a youthful blond God which harkens to a classical style favoured by the Greeks. Why? There may well be theological reasons apart from mere aesthetics... The Christian tradition has long regarded the Living Christ as "eternally young" and this is especially apt for the Risen Lord. St Aelred of Rievaulx too commented on the beauty of Christ and meditated on the sacred and beautiful Body of the Lord. The beardless image of Christ, full of vigour is also seen in early Christian art and revived in the Renaissance by artists like Michelangelo. It seems that Comper may be following in a long tradition. Jesus himself was baptised in the river Jordan. His last words in Matthew's Gospel instruct us to 'make disciples of all nations and baptise them in the name of the Father and of the Son and of the Holy Spirit.' In Acts we read of those coming to faith in Jesus who were then baptised because they had begun to believe. St Paul writes that when we are baptised we are 'in Christ' - and from this comes the word 'Christen' meaning 'in Christ.' He tells us that when we are baptised we are united with Jesus in his death and resurrection. 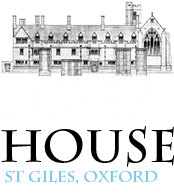 At Pusey House we are pleased to receive requests for Baptism. Baptisms take place on a Sunday, but other arrangements can be made. If you would like to talk more informally about Baptism and find out more about what it means, please contact us at anytime.